This sky map shows the location of the moon and Mars in the night sky at 9 p.m. as viewed from mid-northern latitudes. As the evening twilight deepens on Saturday night, check out the southeastern sky. Weather permitting, you have a chance to see the moon and Mars in a celestial double-play. The moon will appear about halfway between the southeastern horizon and directly overhead on Saturday (May 10) at about 9 p.m. your local time. It will shine as a waxing gibbous moon, roughly 85-percent illuminated. 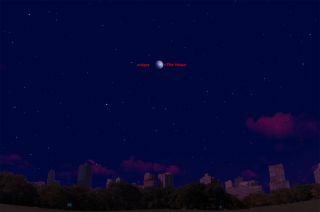 The planet Mars, meanwhile, will be visible well to the left of the moon as a brilliant star-like object. On Saturday, the Red Planet will be 63.3 million miles (101.9 million km) away and will still appear to shine brilliantly at a magnitude of -1.0 on the brightness scale used by astronomers. (Negative numbers denote exceptional brightness on the magnitude scale). Only the moon, Venus, Jupiter and among the stars, Sirius rank higher in brightness. Mars is now glowing with only about 65-percent of the radiance it had a month ago and the fade-down will become even more apparent in the coming weeks. One month from now, it will shine only about half as bright as it does now. And if you look carefully at Mars, you'll see that in spite of its popular "Red Planet" reputation, its true color is closer to a yellow-orange. This contrasts noticeably with the bluish object situated far to the lower left of Mars; the first magnitude star Spica in the zodiacal constellation of Virgo. Spica is number 15 on the list of brightest stars and currently appears only about one-sixth as bright as Mars. Both planet and star are separated by about 15 degrees, while the moon stands about 5 degrees to the right of Mars. Your clenched fist held at arm’s length is approximately equal to 10-degrees in width. Currently, Mars is in the midst of describing an elongated loop against the stars of Virgo. It's in its retrograde or "backward" motion and appears to be traveling toward the west. As a consequence, it's edging farther from Spica, though this will come to an end in ten days when this retrograde motion comes to an end and Mars resumes its normal eastward motion. Although Mars is receding, it is still worth a look if you have a telescope. In a high quality 6 or 8-inch telescope on a night of excellent seeing, you may make out the north polar cap, dark surface markings and occasional white clouds. Right now we are blessed to observe it high above the low-altitude hazes and poor seeing conditions that normally plague Northern Hemisphere observers. Mars will reach its highest point in the sky at around 10:15 p.m. local daylight time, when it will be nearly 50 degrees (or "five fists") above the southern horizon. Editor's Note: If you take an amazing photo of the moon, Mars or any other night sky target, and you'd like to share for a possible story or image gallery, please contact managing editor Tariq Malik at spacephotos@space.com. Joe Rao serves as an instructor and guest lecturer at New York's Hayden Planetarium. He writes about astronomy for Natural History magazine, the Farmer's Almanac and other publications, and he is also an on-camera meteorologist for News 12 Westchester, N.Y. Follow Space.com on Twitter @Spacedotcom. We're also on Facebook & Google+. Original story on Space.com.